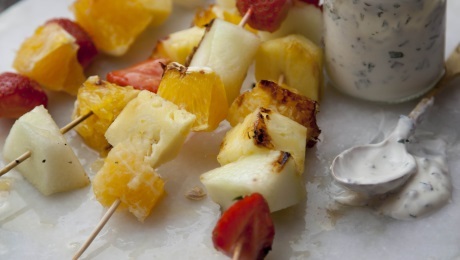 Delicious spiced fruit skewers with honey and yogurt dip. Preheat the barbecue to medium to high heat. In a small bowl combine the orange, lemon juice, maple syrup, mixed spice and Grand Marnier, if using, and set aside until needed. Thread the fruit onto the skewers. Whisk the ingredients for the dip together and place the fruit kebabs on the grill. Brush over the fruit, which will give the fruit a nice glaze. Cook for 2 to 3 minutes. Serve the glazed barbecued spiced fruit kebab drizzled with the dip.